I was sent this book to review and what an incredible book it is. 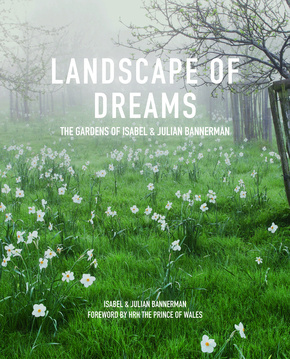 I have had the good fortune to visit a couple of the gardens in the book so I was really interested to know more about Isabel and Julian Bannerman and the gardens they design. The information that came with the book describes it as "the long awaited book by the Bonnie and Clyde of garden design", (which of course in my head makes them Faye Dunaway and Warren Beatty). To be honest I am not exactly certain what is meant by this. I assume it means they are a bit rebellious and unpredictable and always one step ahead of the pack. It's a strange analogy bearing in mind how Bonnie and Clyde ended up. The book covers gardens they have designed for clients, such as the Prince of Wales who also wrote the foreword, their gold medal winning Chelsea Flower Show garden, some private commissions and also the gardens they have designed for themselves. 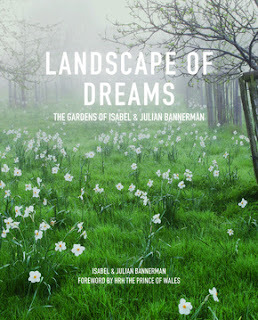 The book is more than a list of gardens, it the traces the story of the Bannermans' lives through their work, starting with their early influences and taking us up to the present day. The plans and descriptions of the gardens show the inspirations behind them. This is fascinating to me as I love learning the background to designs. There is so much more to the gardens than just what you see, there are layers of inspiration and knowledge that meld together to create the final design. The photographs in the book are many; I found myself studying the photographs and the text carefully. They fit together well and also help create a feeling of place in the depicted gardens. It is an interesting walk through the gardens as whilst the designs are quite different, there are different themes that emerge more than once. You realise you are doing more than reading a record of their design but also seeing its evolution. It is I believe fair to say that their clients are quite exclusive. To have a Bannerman garden you are going to be fairly well off. The title of the book is very apt as they do make landscape dreams come true and to do this you need to be able to fund it. So you might think from this that basically the book is about the unattainable and what you can only look at in wonder. I do not think this is so. The grand structures they make are probably not going to fit into the average garden. The grand structures are probably not going to be affordable by many either; but look beyond, in front and around that. Look at the planting that is happening as it is romantic, soft and also very beautiful. The planting ideas are attainable. You can create a corner or a border that would follow their principles, you do not need acres or a lottery win to do this. The Bannermans might be Bonnie and Clyde as prior to this book they have to me felt a little elusive. I had heard of them yet rarely hear from them if that makes any sense? This book redresses this as it feels very personal and helps open a window into their world. It is a book that generously and eloquently shares their perspective on gardens. I truly loved it. I visited Hanham Court shortly after the Bannermans left there, and have seen their work in other places. I'm really looking forward to visiting their new garden in Cornwall this May -- can't wait. And this book sounds like the perfect preparation. I would love to see the gardens they've designed- they are truly spectacular. I've been looking at this book and thinking of buying it. I think it would be something I'd enjoy dipping into. Thanks for the review. I'm not at all sure what they mean by Bonnie and Clyde though. That is so odd.